Now available on Kindle, the book is a comprehensive and practical guide for all those who would like to make their lives exciting, fulfilling and successful. 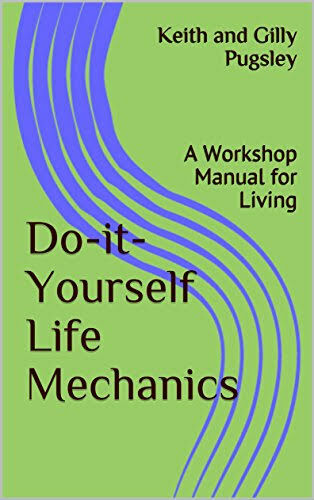 It is, essentially, a coaching manual that can be used by the Do-it-Yourself enthusiast to coach him/herself towards fulfillment in his/her life, or to coach others in this direction. It uses the metaphor of The Life Machine, which comes in many shapes, sizes and states of condition. Every Life Machine is made up of fourteen components which can be serviced, repaired or replaced so that the Life Machine can be kept running in smooth and efficient order. The techniques described in the book have been used for the last ten years by the Life Mechanics, its authors, to effect change and improvement in their lives and the lives of many clients, and many of these successes are also reported. Illustrated with drawings, plans and diagrams, the book introduces the concept of Life Mechanics, and how the manual may be used to improve the Life Machine of the reader. It continues with instructions on how to dismantle the Life Machine into its component parts, fault diagnosis and the planning and resourcing of repairs. Fault diagnosis is achieved by asking a number of focused questions, or occasionally by the performing of a focusing exercise. Full instructions are given in the text. The vehicle in your garage is essential for getting you and the items you need from A to B. But you have another vehicle – your body, which includes your mind and emotions and all that is vital to making your life as smooth-running and as successful as possible. If you think of a car manual for you then you are already getting a benefit from Do-It-Yourself Life Mechanics. Keith and Gilly Pugsley, in clear instruction, provide maintenance techniques for readers as they venture along the roads of life; how to cope with relationship breakdowns, how to choose the right career, how to walk away or stand your ground. For those seeking guidance towards a more harmonious life this book will be a welcome addition to the library. Why not sign up to receive all new postings on the Life Mechanics blog as an email, direct to your Inbox? It's easy to do if you're viewing the web version, enter your email address in the box below 'follow this blog by email' at the top RHS and tap/click Submit.